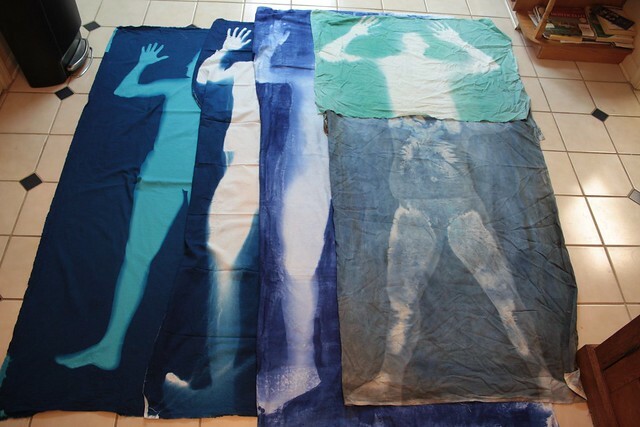 Last year I was testing different ways to make human-sized sun prints on fabric. It was for a Security Blanket quilt I thought I might submit to Quilt National so when I discovered that their restrictions on publicly showing work were tighter than I had thought, I deleted the photos from my Flickr and Instagram accounts. But I digress. I’ve since submitted two other quilts to QN and decided that this one should be part of the upcoming Privacy in America show at my local art center. I’m not going to bother retreiving the old photos, but I’ll share new ones. Turquoise colored fabric treated for cyanotype by Blueprints on Fabric. This print (me laying on the fabric approximately 12 minutes) was made on a sunny day this May and turned out great. I was the pinnacle of my tests and will be what I use in my final project. White fabric treated for cyanotype by Blueprints on Fabric. This print (hubby laying on the fabric approximately 12 minutes) was made on a sunny day last November and even though it was done at noon, the angle of the sun was too much and I wasn’t happy with the results. The top print on the right is the result of laying my husband on white fabric treated with soda ash and using him like a stencil around which I sprayed Procion dye concentrate. There was more bleeding than I liked and the color was not nearly as intense as I had hoped. It took longer to clean my husband off than the rest of the process. Definitely not a technique I’d bother with again. The lower print on the right is my first attempt. I painted white fabric with both Seta Color Transparent paint and thinned acrylics, then laid on the fabric while it dried (45 minutes last summer). It resulted in an interesting print, but it where I sweated (especially around the face) the colors bled into odd ghostly shapes, and I ended up with a sunburn for my efforts. I also wasn’t happy with the scuffed look of the final product once it had been set and washed. Now I that I’ve settled on the cyanotype prints I have the basics for my quilt and the construction can begin. When I started pinning fabrics to my design wall I wasn’t quite satisfied with how it was looking. luckily, my friend Natalya came to visit and I showed her what I had. Her comments corrected my course and I’m excited to continue working on this — even though it totally needs more work than I had originally thought. I can’t wait to see further developments!